Our worship relies on participants and leaders of all ages throughout the congregation, including opportunities for children, youth, and adults. 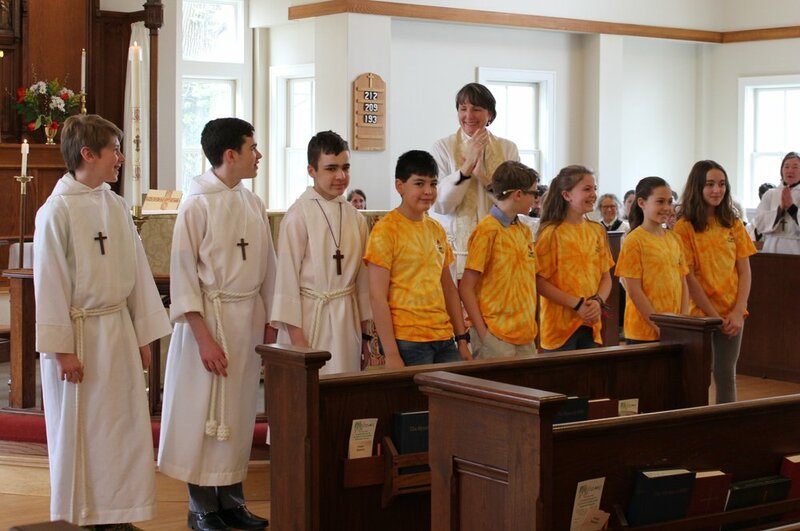 We invite all students into the ministry of service as an acolyte, beginning in the spring of fourth grade. Acolytes are trained to carry the cross, light and carry the torch and hold the Gospel, and they lead the opening and closing processions at the 10 am services. Some choose to wear their “St. Anne's Torch Team” t-shirts to stay cool under their robes! In this ministry, teens and older elementary students have more time to bond and experience some of the roles we all play as contributors to a parish family. If you are interested in joining the acolytes, please email Sarah Jennings. If you are interested in helping to lead worship as a lector, lay eucharistic minister, or usher, please email Kristina DeFrancesco.